Sometimes I wonder whether my new town, Almaty, might also deserve such a reconsideration. In the imagination of Kazakhstanis, and even Almatians themselves, the city is a concrete town, full of hotels, theaters and administrative buildings, microdistricts and modern highrises, and yes, it’s certainly true that the center of Almaty is dominated by four- and five-story buildings. Yet if you look at a satellite map of the city, you’ll see that territorially-speaking, Almaty is a town dominated by its chastny sektory, its cottage neighborhoods. Indeed, there are some city boroughs, like Turksib and Alatau, that consist almost entirely of low-slung homes, and it is this sprawling periphery of the city that is growing fastest in our 21st century. 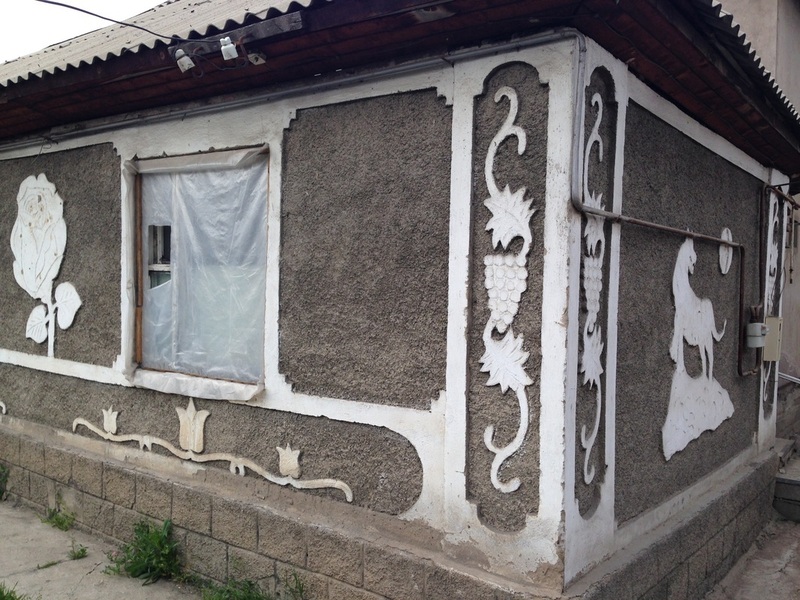 If you want to see the future of Almaty, the future is a single-family home, privately-owned. 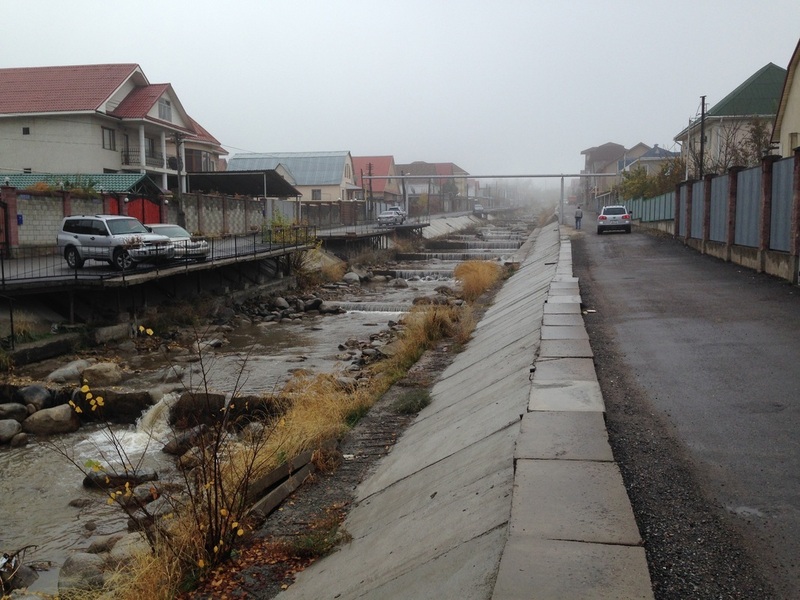 Before I came to Kazakhstan, I read a lot everything I could find about Almaty, but I never heard about these cottage districts; it was as if they didn’t exist. So when I arrived, these were the places I sought out, the forgotten corners of a great city, absent from it’s self-image. I’ve now covered hundreds of kilometers through these neighborhoods on foot, and I’ve documented it all for this project I call Walking Almaty. What I’ve found is that the single-story sector is a place that deserves its due. It’s a part of their town that Almatians should be proud of, because it exhibits some of the very things that the city holds dear: its world-class nature, its diverse culture, and its streak of creativity. Why is it that the chastny sektor has all these things, but in the minds of Almatians, it’s an afterthought? In the city center, nature is often fit into man-made containers: tree roots under sidewalks, rivers with concrete banks. In the chastny sektor, nature comes out to breathe again. In the Turksib district, you can find fishing ponds like Airport Lake and Parhach, full of carp and waterbugs. Neighborhood kids come in the summer with their fathers’ fishing poles, and in the winter families come with their sleds and skates, enjoying the open space and the mountain views. Nameless tributaries of the Malaya Almatinka river run through the chastny sektor east of Baum’s Grove, Almaty’s largest park and a green oasis that is itself surrounded almost entirely by cottage districts. You usually can’t even find these creeks on city maps, nor can you find any sign of the rusty footbridges that cross them. Satellite imagery, though, reveals wreaths of green wrapped through swaths of small homes. On the city’s northwestern frontier, tributaries from the bigger Almatinka river have carved deep gullies through the steppe, and shepherds still bring their lambs there to munch grass. Social media sites here are full of selfies in the mountains, Almatians gushing with pride, yet high-rise dwellers may not even realize they can just as well head to the one-story lowlands and shoot a selfie with a sheep at a watering hole. Apartment renters aren’t just missing out on entire ecological zones, but cultural realms as well. The center, many visitors remark, feels positively European, which is to say that it’s been globalized, secularized, and whitewashed into anonymity. In the chastny sektor, there’s a sense of place, a Central Asian flavor. Cossack pigeon fanciers keep birds they call “Uzbek tumblers”, and walking these districts you’ll often see them flipping in the air before landing on perches that tower above the modest homes. The pigeons out here fly over minarets and onion domes, but in the center mosques and churches are sparse; whether intentionally or not, conservative religious life has been relegated to the margins, and it’s only in the chastny sektor that you’re likely to hear the azan, the Islamic call to prayer, soaring with the birds. 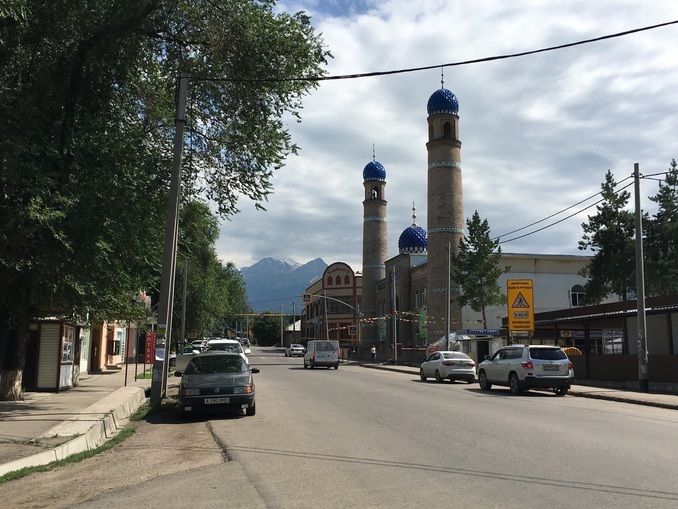 These religious centers are especially important for Almaty’s many diasporas; in the chastny sektor you’ll find mosques where the imam preaches in Uyghur, or Armenian churches. True, the city’s concrete center is also diverse, but the diversity is scattered. In the chastny sektor, extended families can buy up clusters of homes and make their own enclaves. Walk these regions and you’ll find pockets of the Caucasus or Bashkortistan, cultural satellites to motherlands a thousand miles away. 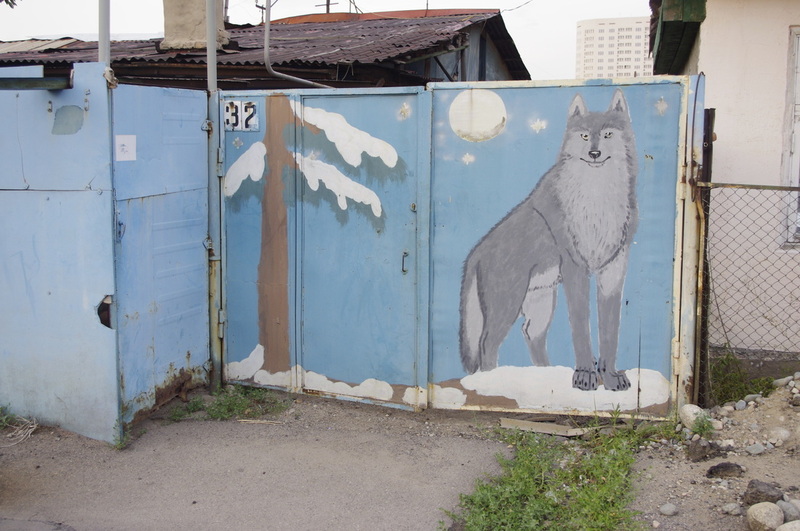 But what I most love to find in these corners of our city, and what I’ve documented the most on Walking Almaty, are the places where people, given the freedom of owning a private home, have unleashed their creativity and made a mark on their neighborhood. There are no cookie-cutter homes here. Every house has carved windowframes all its own, or a personalized facade, or a roof sealed by hand. From the street you can see one-of-a-kind wooden or metal gates, mailboxes, or doorbells. Even when the owner wants to sell his custom home, he doesn’t buy a “For Sale” sign, but writes those words with paint on the gate, his own script stamping his creation. In the chastny sektor, that personal touch is everywhere, a thousand traces of a thousand lives. 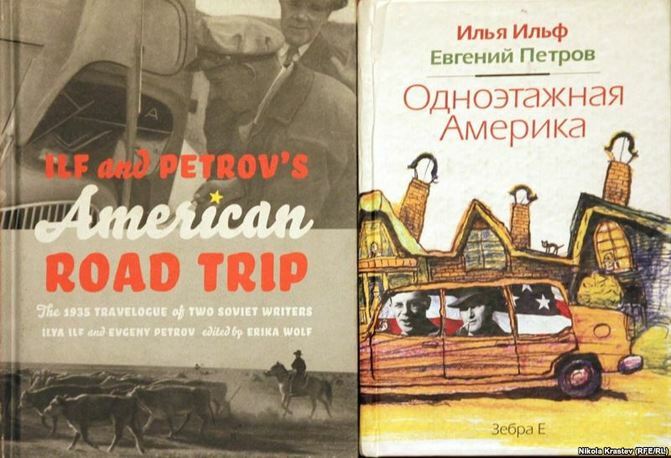 When Almaty was Soviet Alma-Ata, it was wood that became the greatest medium for creativity. Running along the eaves of the home, you could find carved fascia boards, long wooden planks that with a saw and drill can be made to resemble teeth, or icicles, or diamonds. 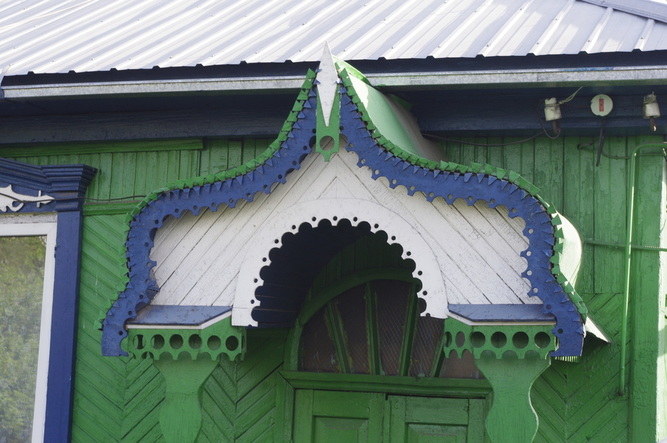 When these boards were glued to the end of a gable roof, the roof ridge might be topped with a carved wooden icon, looking like a heart or a spade or a drooping hand-towel. Wooden ornament was draped around windows, too, breaking up the monotony of solid facades. The space above the window was where a homeowner could really express himself. Most often you’ll find primitive suns and rhombi, but the geometry can get elaborate, and sometimes the woodcarver puts up stars, birds or butterflies. One time, I spotted a house with a gorgeously carved porch, but the rest of the exterior walls had been covered in plastic siding. The homeowner was outside and I asked him, incredulously, what he was thinking. “Eh, fashions change,” was all he could muster. Indeed they do. These days, expressive wood is harder to find, but it was succeeded by ornamental plaster. Nicknamed shuba, or “a fur coat”, this is the supreme Almaty folk art of the late 20th century. Old cottages were dressed up not with sable skins but with stucco, colorful paint, and crushed glass, so that they went from bare to bold. Grape leaves, kissing swans, compass stars, flowers and birds are all a bit kitschy, sure, but when painstakingly put into plaster they are sincere expressions of individuality in a commodified world. In the 21st century, even the chastny sektor has gotten more store-bought, with mass-produced metal gates outside most homes, but what’s remarkable is that even these gates have somehow, after wood and plaster, become a new medium of choice for Almatian innovation. They’re assembled in China by the millions, I bet, and you see some of the same incongruous symbols everywhere you go, like the dharmachakra or the regal lion. Yet despite some repetition, you’ll find tens of thousands of metal gates in Almaty, and most of them are unique. It’s as if Almaty’s chastny sektor, so devoted to its aesthetic of personalized design, has made a courageous declaration: These homes will not be conquered. Flush the market with all the building supplies you like, but this individualism is here to stay. That individualism, I would argue, is the greatest mark of Almaty design today. It is reactionary, a revolt against the strictly-coded, neatly-ordered aesthetic of Soviet central planners. It is innovative, a creative impulse that can move from wood to plaster to metal, transforming every new thing into some new new thing. It is organic, as imperfect as the weedy gullies or clumsy pigeons that make the chastny sektor a place that we can at once pity and feel proud of. Odno-Etazhnaya Alma-Ata, "Single-Story Almaty", may often be shirked aside by the very Almatians who should be rallying to its side, but this is the creative lifeblood of the city, not the trained sculptors at the Zhurgenov Academy or the overpaid drafters at Bazis Construction. Almaty’s single-story sector is a vast colony of vernacular designers, wielding bazaar-bought tools and a DIY spirit, and their realm deserves exploring. So if I’ll be Ilif, where’s my Petrov? Let’s go write a travelogue.